Thursday 12th November 2015 was a momentous day for Irish theatre and Irish women. The #WakingTheFeminists event at the Abbey was a deafening roar from women who had been silenced for too long, as well as a proud celebration of the amazing Irish women who work in theatre. I am in awe of the organisers for making it happen so quickly and run so smoothly. That meeting, that large ticketed event, with 29 speakers from across the theatre sector, with sign-language interpretation, that was recorded and broadcast online live; they put all that together in about a week. It also started and finished on time, or close to judging by tweets and the length of the video. And it was a beautiful theatrical event. 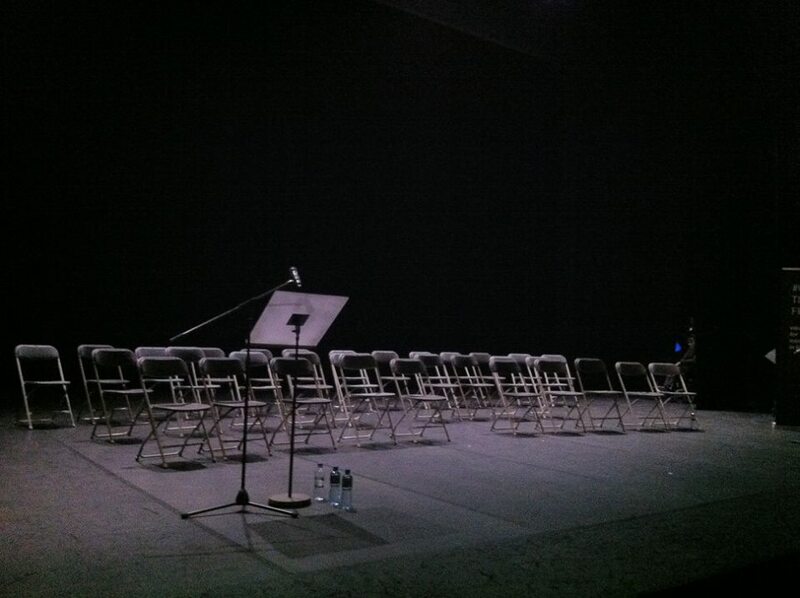 I loved that image of the empty stage that slowly filled with women as each speaker sat down after they said their piece. I love that they included Lucy Kerbel from Tonic Theatre, a UK company set up to help their theatre industry achieve greater gender equality. I love the dance party at the end, that’s included in most of the videos of the day’s event. I also love all that press coverage. This is an organised movement with a lot of savvy producers in it’s midst! And very well connected – so many high-profile men and women from all over the world have shown their support in the last couple of days. It was also very encouraging to see the incoming Abbey directors – Neil Murray and Graham McLaren tweeting their support on the day. This is just the first step, I think there’s still a lot of hard work to be done before we see any real change in the theatre landscape. But it’s an incredible first step. It’s so hopeful and buoyant, it’s people working together and being generous to each other, and making change happen. The will is there and the last two weeks have shown that change is possible – the Director of the Abbey recognised and admitted to mistakes in the 2016 programme. I don’t know yet if there are any plans to make changes to that programme, but it’s still a good first step. I would like to see other funding bodies make a similar commitment. In September, the Arts Council published their new ten-year strategy, Making Great Art Work – Leading the Development of the Arts in Ireland (pdf). Right now, they are asking people to respond to the strategy and suggest which objectives and actions to focus on in the first three-year plan. Right now, the strategy does not include any references to gender equality. After everything that’s been said in the last couple of weeks, this feels like a grave omission. Working towards gender equality should be a priority in that three year plan. A rising tide lifts all boats, and you can’t make truly great art if you are not supporting female artists. You can respond to the plan here.